A garbage disposal can be a very useful addition to a home’s kitchen, letting you dispose of food waste while also preventing clogs. With all of the heavy duty work that a garbage disposal does on a daily basis, disposals occasionally require maintenance and repair to perform effectively. If your disposal is not functioning correctly, or if you’re considering a new disposal installation to upgrade your kitchen Master Plumbing & Mechanical can help. While garbage disposals work great for breaking down light food residue, they are not designed to handle large quantities of waste. Sometimes, a metal object, such as a utensil, coin, or staple, can jam a disposal. If a garbage disposal is overwhelmed, homeowners can may be able to correct the problem by hitting the reset button on the disposal or removing the foreign object with a pair of pliers after turning off the power at the circuit breaker. However, homeowners should never place their hand inside of a disposal in any situation. 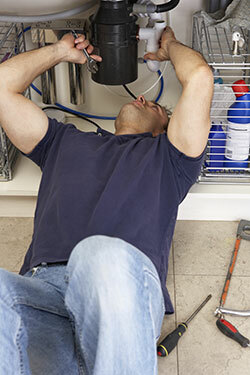 When in doubt, the experts at Master Plumbing & Mechanical are available to determine the best solution. A garbage disposal can reduce a home’s overall garbage output by pulverizing most common food scraps so they can be removed through the sink as wastewater. A garbage disposal fits virtually seamlessly into the sink, and can be maintained by simply disposing of a few ice cubes and some baking soda once a month to sharpen the blades and reduce unpleasant odors. A garbage disposal is also an environmentally friendly option because it reduces the need for landfills, and sends helpful food waste to water treatment facilities to be recycled into new energy. With less rotting food scraps in the trashcan, a garbage disposal can also create a cleaner and more sanitary environment in the kitchen. For more than 70 years, InSinkErator has been the first name in the garbage disposal industry. InSinkErator garbage disposals are the quietest, most efficient garbage disposals on the market, and have earned a reputation for easy installation. It’s no wonder that InSinkErator garbage disposals are the best-selling garbage disposals in the world. Master Plumbing & Mechanical services the Washington, D.C. metropolitan area. Contact us for garbage disposal installation and repair service.